A sensitive showstopper: Colin Hambrook reviews the headline act of the Unlimited Festival as part of Exeunt’s collaboration with Disability Arts. Assisted Suicide: The Musical at the Southbank Centre. Since Southbank Centre announced last April that the headliner for this year’s Unlimited Festival was due to be Assisted Suicide: The Musical there has been a buzz amongst the disability community. Evoking huge respect for her campaigning work, speaking out for Disability Rights, her podcasts on BBC’s Ouch, her stand-up routines with Abnormally Funny People and her part as Clarissa Mullery on BBC’s drama Silent Witness, Liz Carr is known for her passionate activism, quick-fire – and at times acerbic – wit and her talent as an actress. This sensitive showstopper Assisted Suicide: The Musical didn’t disappoint. As Carr has explained in much of her activism, suicide isn’t funny, but that doesn’t mean you can’t take the rise out of society’s absurdly hypocritical attitudes towards the death that will not speak its name. Alongside some stomping good tunes backed by the musical talents of Isaac Bernier-Doyle, David James, Stephanie James and Claire Willoughby we learn of the attempts of the pro-assisted suicide lobby to rebrand the premise from that of ‘suicide’ to ‘deliberate life completion’, ‘compassionate termination’ and the unbelievably offensive term ‘dignicide’. Underwritten by extensive research and a euthanasia road trip to key figures living in the six countries where assisted suicide is legal, the performance is exactly as Carr describes it: “A TED talk with show tunes”. Assisted Suicide: The Musical provokes and entertains in equal doses, moving in turns from a Butlin’s Redcoat aesthetic, to the hospital hoist, to the conference room and then to a sparser stage where Carr is very at home in direct engagement with her audience. Changing tempo from in-depth dialogue to unashamed entertainment, at its core the show is essentially about our shared humanity and how we navigate the turbulent waters of understanding what it means to be a disabled person in today’s society. From the opening number ‘I’m Choosing Choice’, the razzmatazz of ‘Me and The Pope’ to the rousing ‘End Your Life’ the audience are invited to clap and laugh along with some densely written toe-tappers from Ian Hill (known for Duckie’s Olivier Award-winning C’est Barbican and also his work with Rose English). 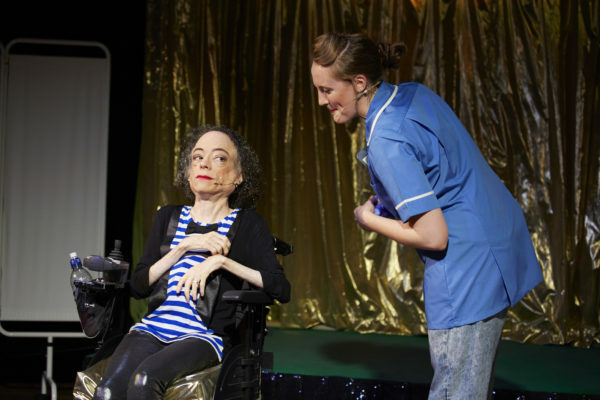 The denouement shows a reflective side of Liz Carr with the sweet, melodic duet that she has with herself via a screen persona. ‘Close the Door’ gives her the chance to express the inner-turmoil around personal confrontations that her campaigning has opened up for her. Assisted Suicide: The Musical is refreshing in collaging complex argument with downright wholehearted fun. Carr’s fascinating journey and commitment to debunking the fears and prejudices that lie at the foundation of the assisted suicide debate presents an original, unprecedented piece of musical theatre. For those of us with personal assistance needs the implications of attitudes imposed on us is that our deaths are welcome. “I would rather be dead than live like you” is a daily message relayed often by casual strangers whose message may be intended to be well-meaning, but is crucially hurtful. Under the pretext of justifying a change of legislation that it is for the ‘terminally ill’, the real message disabled people are getting is that this means ‘us’. Yet the reality is that having need of personal assistance in everyday tasks has no bearing on quality of life. Ultimately Carr’s message is a positive one. If we transferred time, costs and energy from assisted dying to assistance to live and palliative care, then many individuals faced with the seemingly hopeless world of adapting to becoming disabled could still have a fruitful life. Several years in the making, applause must go to Shape and ArtsAdmin who run the Unlimited programme for commissioning this rewarding, provocative and enthralling piece. This piece was produced in partnership with Disability Arts Online, a web-based journal for critique, discussion and promotion of work by disabled artists. Colin Hambrook is Disability Arts Online’s founder and Editor.